The Madonna Inn is a kitchy motel located in the town of San Luis Obispo, CA. 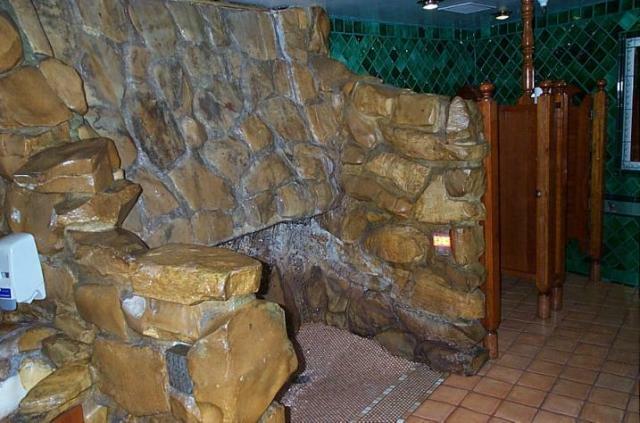 It is famous not only for its themed rooms and over-the-top decor but also for its elaborate urinals, which are noted as a tourist attraction by the San Luis Obispo Chamber of Commerce. This is the front view of this world-famous urinal, as photographed by Urinal Dot Net staff in 2000. The black square on the left side wall is a light sensor that activates a waterfall that pours down the rear of the urinal structure when a person stands at the urinal. This is a view of the waterfall in action. In the photo above you can see the reflector mounted on the opposite urinal wall from the sensor. This urinal can accommodate two people. 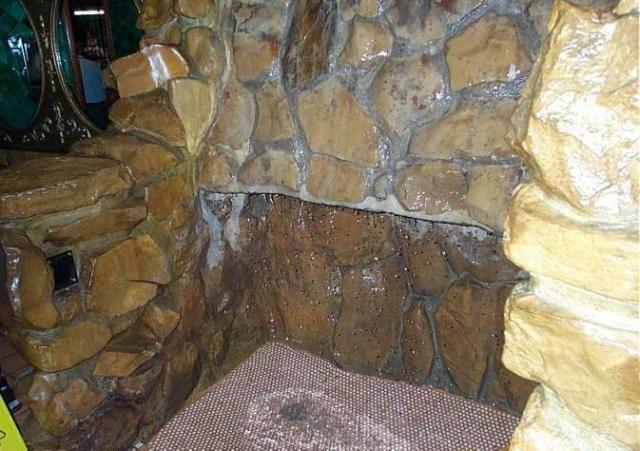 The above picture of another urinal at the Madonna Inn was sent in by an independent contributor in 2002. He writes: "A recent vacation down California's Central Coast brought me to the famous Madonna Inn in San Luis Obispo. After enjoying several iced teas at the lunch counter, it was necessary to visit the restroom and while I wanted to visit the world-famous urinal there, time was of the essence and I discovered another restroom closer to my position and headed down the stairs. 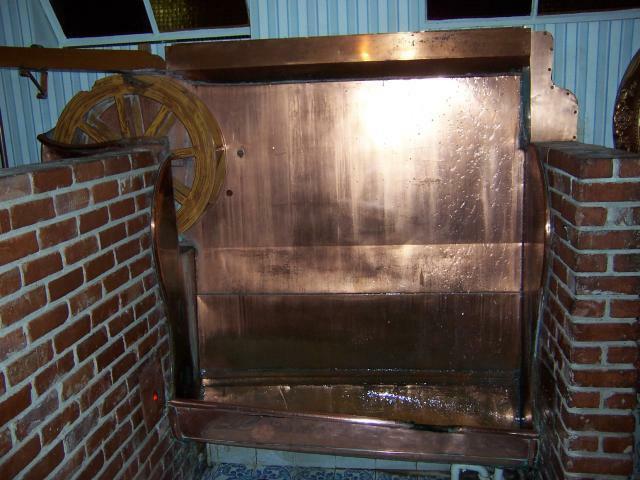 Well, you can imagine my surprise when I went through the door and found a towering Copper Trough Urinal complete with waterwheel!! It was incredible. 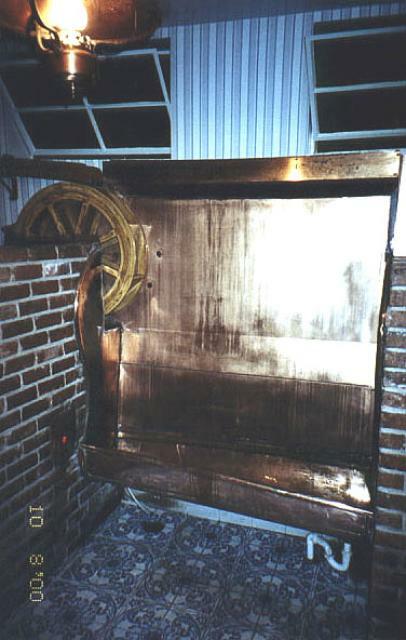 The electronic eye beam was present and when activated, the water wheel on the upper left began turning and splashing water down into the trough. (Quite a find, I'm sure you'd agree!!). The design certainly evokes the romance of the Old West. In fact, the whole men's room had an Old West ambiance as the sink faucets were actually pumps like you'd find on a well and the doors to the stalls were the types you'd find at the entrance of a saloon." 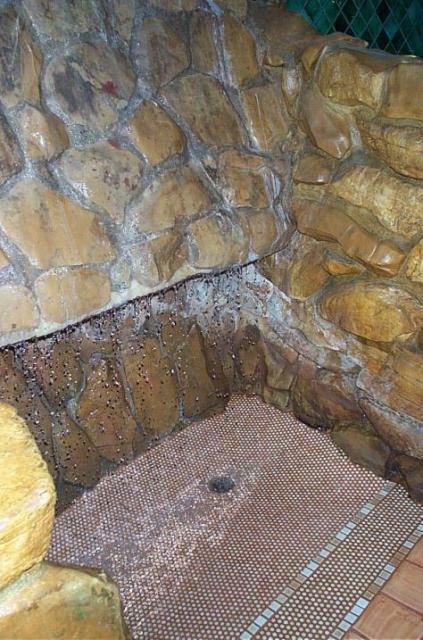 This photograph of the same fixture was taken by a member of the Urinal Dot Net staff in 2004.